On 19 June 2010 I came to an important decision for me about posting images on the web. Previous to that date for some years I had been ensuring that the images that I had posted carried metadata stating my copyright and contact information, and posting the images almost entirely on sites where that information remained intact. But I’d found some were appearing without my permission on blogs and other sites with that information removed (but unfortunately never on sites that seemed worth suing, though most did respond to my requests for removal or in some cases attribution.) Even on sites that had asked and/or attributed and/or linked, the images themselves had often lost its metadata when images had been resized for use. So, almost 3 years ago, I started routinely adding my copyright and contact details fairly discretely along the bottom edge of every image I uploaded onto my own web sites (those in commercial libraries have a more obvious overprint from the library.) People told me I should put it across the middle so it won’t be cropped off, but I wanted to avoid unduly diminishing people’s enjoyment of the work. And clearly if anyone cropped the image to remove the copyright they would be breaking the law. The message ‘Copyright © 2010 Peter Marshall mylondondiary.co.uk‘ isn’t always too clear to read, but it is always (with a few rare exceptions) present on images posted since then – and occasionally I’ve got around to changing the year to match the current date. Usually by around March the following year. It isn’t perfect, but it would be very hard for anyone to claim ‘due diligence’ and use the work without payment given its presence. And of course I can be contacted through a link on the front page of the listed web site. is entirely true, though I am a little worried about the many images I still have on-line without a visible watermark – probably at least 30,000. I haven’t yet found a simple piece of software that will enable me to batch process them simply and add visible information in a way that it isn’t easily removed, though I suspect it wouldn’t be too difficult to write. I’ve also made sure that my name, which appears visibly on the images is available through the only current registry, PLUS, still in Beta. Becoming listed is free, but “The PLUS Registry operates on a co-op model, funded by optional contributions from “Supporting Members” who are able to make a small annual contribution. As a Supporting Member, you will receive a unique PLUS Member ID for your business, for use in images, licenses and documents of all kinds.” It’s free and easy to set up a basic account, and there is a video tutorial on the Help page which takes you step by step through it if you need it. The UK law is only a skeleton, which will be fleshed out by statutory instruments which will be issued later this year, which I hope will explicitly include the need for those wanting to make use of images to look at metadata and visible information and search PLUS and other registries that may be established. 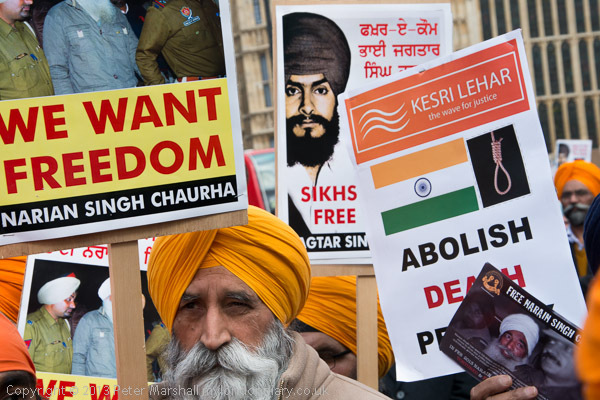 It seems fairly likely that the legislation will be challenged legally as in breach of various international treaties including the Berne Convention, as well as becoming the subject of protests by photographers and other interested parties. 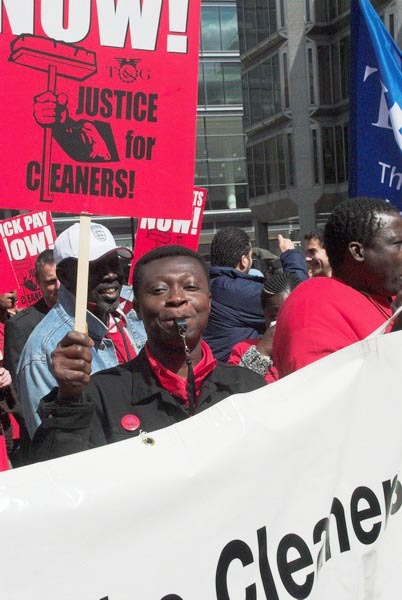 Although low paid workers have managed to get some employers to pay the living wage, mostly as a result of very public noise protests outside workplaces, there is still a long way to go, and even where workers have managed to get the living wage, the terms and conditions of many low paid staff are still grossly inferior to those of others who work in the same places. 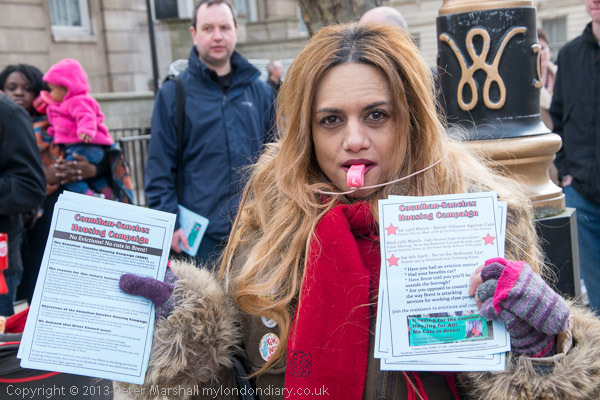 I was at the University of London to photograph a protest by low paid workers there in what they have called the ‘3 Cosas‘ campaign. While some of those working in the university buildings are employed directly by London University, most of the low paid workers are employed by other companies – they are outsourced. And outsourcing saves the University money not by employing other people to manage their staff, not by more efficient working, but by cutting down on things like pensions, sick pay and holidays. These are the three areas, the three causes of the campaign. While the university itself would not dream of treating its employees badly like this, somehow it is quite happy to pay other people to treat its workers badly, to exploit them. In fact not only are the conditions bad, but many also experience bullying, racism and other forms of disrespect from the managers employed by the outsourced companies. The first protests by low paid workers that I photographed were supported by traditional unions like the T&GWU (Transport and General Workers Union – now a part of Unite) but sometimes it seemed to the workers that the these unions were not too keen to fight for their cause, often seeming too ready to concede and bargain with employers rather than to really push the claim for justice, and to allow companies to victimise some of the more militant workers. 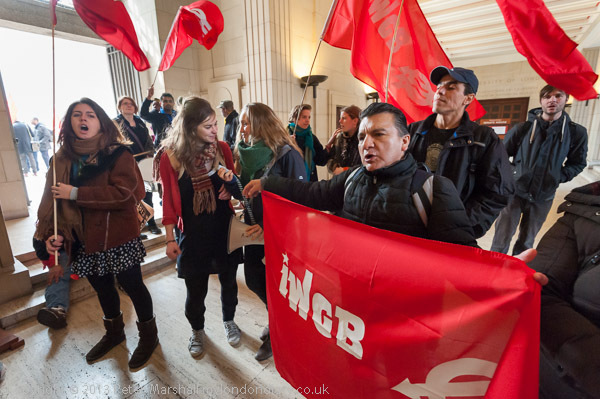 Many of the cleaners joined the IWW (Industrial Workers of the World), and later broke away from the other English branches of that to form a new union – though with an old name – the IWGB. 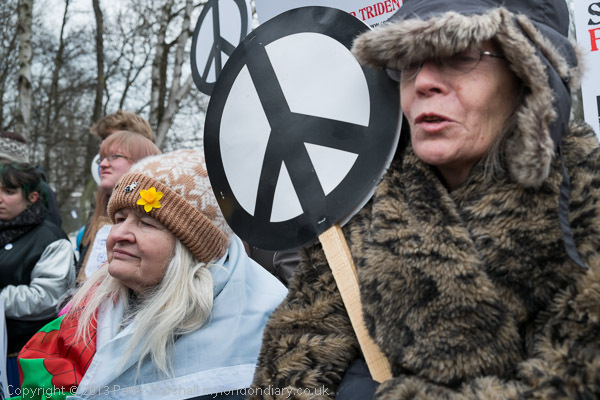 So one of the things I’ve been keen to show when photographing their protests are the flags, placards and banners with the union insignia, although of course in a way that seems organic to the action – I don’t want to pose these any more than I pose people. The banner here is fine, though the flags illustrate that these are tricky to photograph, often fluttering madly or hanging limp. One other problem can also be seen in the image above is that of lighting contrast. The protesters are in a ground floor area below the building which, although it has large open doorways, is still considerably darker than outside. As you can see above, to maintain detail in the shadows inside means that the highlight areas through the doorway at left are largely blank. I’ve had to burn them in considerably to darken the figures outside as well as bringing down the ‘white’ slider in Lightroom down to bring the white area just within range. Where possible I avoided the problem, as in the second image where I deliberately made the image from a position where the speaker effectively blocks the doorway behind. It seemed too that it was an image that summed up much of what the protest was about, both in the attitude of the speaker – helped by some nice rim lighting as well as that open mouth, but with the text of the placard and the solidarity of the people with their red flags and banner in the background, backing up the demand. 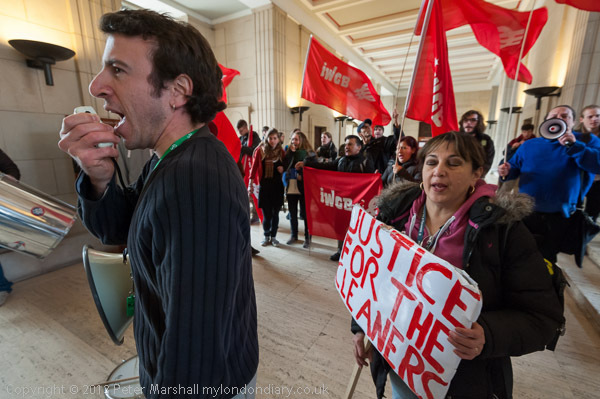 More pictures from the event, inside and outside the lobby and more details of the situation and the campaign demands at ‘3 Cosas’ -Sick Pay, Holidays & Pensions. Although I’d felt in my bag for the 10.5mm earlier in the day and found it wasn’t there, it was really at the last event of the day that I missed it. 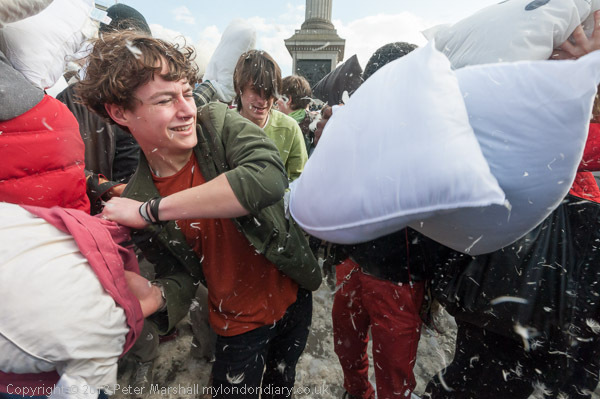 It would be easy to dismiss World Pillow Fight Day as a bit of fluff, and probably correct to do so, but it is rather a fun event, and it’s good to get stuck in there whether with a pillow or a camera. 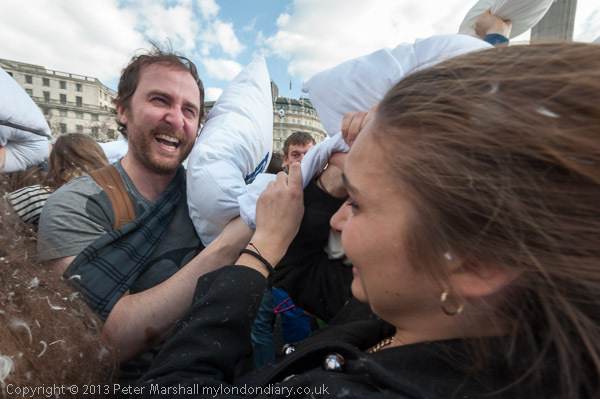 One of the few rules is that those taking part are not to hit photographers, but given the chaos that erupts, this is impossible, though some people did apologise after having realised they had attacked me. But if you don’t want to get hit you really need to keep our of the crowd, and where’s the fun in that whether you are wielding camera or pillow. 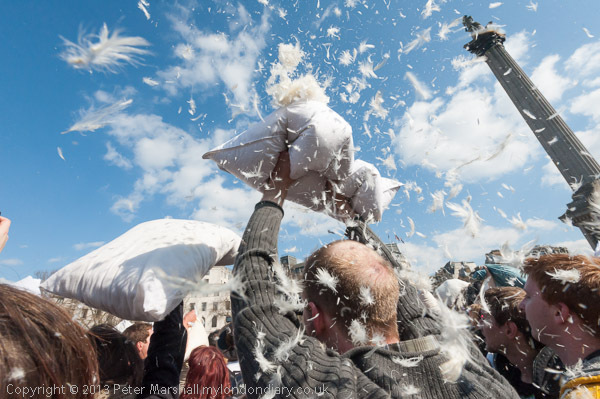 Certainly in some earlier years there was also a rule that feather pillows were not allowed, but this too is one that has never been adhered to, and the air was soon thick with feathers and dust, as many of the pillows split, and we were dragging our feet through a few inches of pillow fillings across much of the centre of Trafalgar Square. It was a close and personal occasion, and although I had both Nikons around my neck, the only one I used was the D700 with the 16-35mm, and almost all taken at its widest. There really was very little time to think or to frame, let alone to zoom as the action got going, and despite the sunny afternoon I was using a fairly high ISO 1250 to to get both sufficient depth of field at close working distances and also to stop the fairly extreme motion. Typically the pictures were taken at around 1/1000 at f11, but I was using both autofocus and auto-exposure. I put my flash away inside my bag – it wasn’t needed and would be rather vulnerable to damage by pillows when sitting on the hot shoe. Flash isn’t too useful at very short range although there might be some nice effects with it lighting up the feathers in the air, the sun was doing quite a good job. I did lose the lens hood from the 18-105mm in the melée, but fortunately replacements come cheap on eBay, and are at least as good as the genuine Nikon item that costs around ten times as much. You can find them advertised at from a little under £2 post free to almost £40, and I think there is no difference between them. They are all fairly flimsy plastic and all fit the poorly designed bayonet on the Nikon lens. More than two weeks later, I’m still finding feathers in the pockets of the clothes I wore and in odd places in my camera bag. 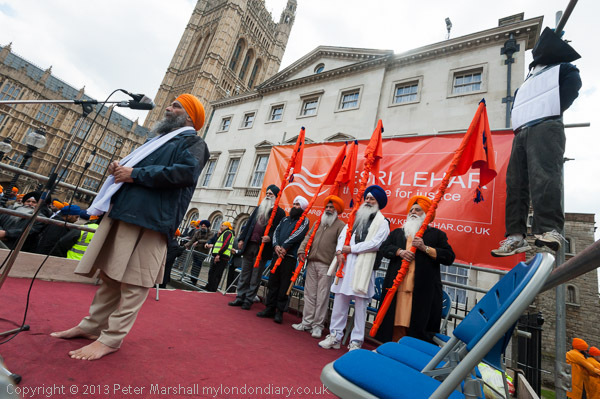 You can see a few more too in the pictures of the event at Feathers Fly in Trafalgar Square. After half an hour or so, the dust from the feathers and kapok was making my throat very dry and I felt I’d taken enough pictures. It was a good excuse to make my way to a nearby pub along with a photographer friend and relax a little before going home. Last night I had a dream. Not I suppose unusual, but I seldom remember my dreams, and few of them relate to photography, but this one contained two very clear photographic images, and it is those that I remembered when I woke up in the middle of it at around 5am. I can’t recall more than the small incident that involved them, but I do know that they were taken with the 70-300mm Nikon lens, and that somehow at the same time as looking through the camera I was also looking through the sight of a rifle at the man I was photographing in the first of the two images. The images were bright and colourful, although the details have rather faded from my mind now, but I was seeing these, and a slightly less clear wide-angle view of the scene, and thinking thank goodness I hadn’t pulled the trigger and shot the man, which had been my initial reaction. Looking back on the pictures in my dream I realised he couldn’t really have been using a poison dart at an event like that, and was clearly aiming to miss – as he did. I also remember thinking, before I woke up enough to swing my legs out of bed and go to empty my bladder, how surprising it was that both of the telephoto pictures were sharp, though I can’t now recall the aperture and shutter speed! It was only as I got on to my feet that I realised that these pictures were not real. No doubt my analyst – if I had one – would have something to say about all this. I’m not a pacifist, though I’m generally against war, but had I been born 20 years earlier than I was I think I would have gone to fight fascism though perhaps my skills would have more useful away from the front line. I’ve never owned a gun or rifle – and the only guns I’ve ever shot have been air-guns and air rifles, mainly at targets in friend’s back gardens when I was a teenager, or at the fair. But I don’t shoot pictures with my camera. ‘Shooting’ pictures is a metaphor that I try hard to avoid. It doesn’t reflect the way I think when I’m working with a camera and I find it disturbing, though it has become so much a part of our normal language of photography that it’s hard to avoid – and sometimes I find myself slipping into it. I never hunt for pictures either. I don’t even like to think of myself as ‘taking’ pictures – it still rather sounds like I’m stealing souls. I’m rather happier to ‘make’ pictures, and often to make them with other people who are in front of my camera. From the Sikh protest against the death penalty I walked the short distance up Parliament St and Whitehall to where the Counihan-Sanchez Family Housing Campaign were holding a protest against the bedroom tax and other tax and benefit changes that impact unfairly on the poor and disabled. No to Bedroom Tax & Benefit Caps was a relatively small protest over issues that affect many, and one in particular that seems to those affected to be a particularly vicious and vindictive attack on those at the bottom of our society. Homelessness and the housing problem isn’t caused by poor people who have a little space in their homes (something the better off in our society take for granted), but by policies that have failed to build social housing, have rocketed house prices and private rents, in part through vast subsidies to private landlords through ‘housing benefit’, by the increased growth in second home ownership and the buying up of houses and flats as investment properties, and by the many properties left empty as their value increases. It’s a problem that Tory, New Labour and Coalition governments at least since Thatcher have not just failed to tackle but have actually contributed to. 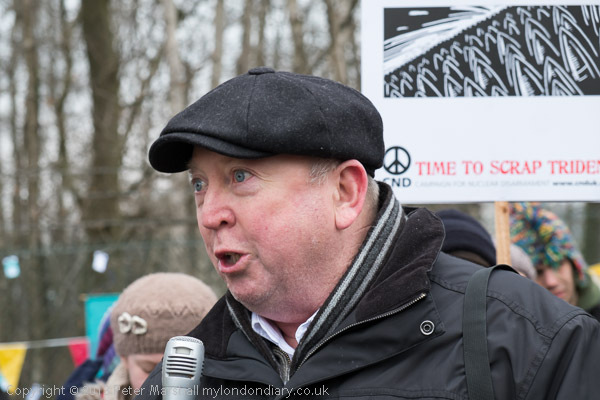 Most of those present were from Kilburn, where the Counihan family has waged a high profile campaign against its own unfair treatment by the local authority, the London Borough of Brent, and encouraged and inspired others to stand up for their rights. 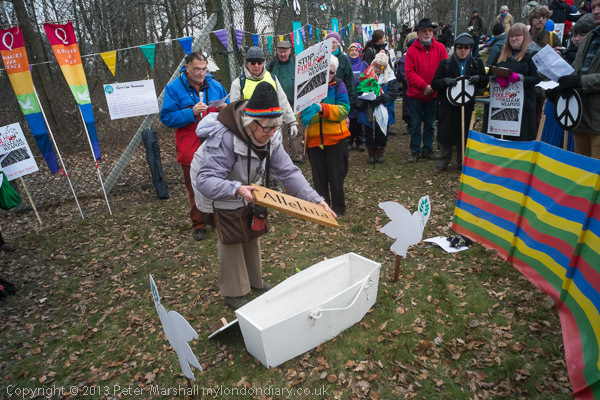 One of those, a young woman and her daughter who had managed to get Harrow council to fulfil their legal obligations to her spoke at the event, as did a number of others. But though the various addresses were interesting, it was had to find much of great visual interest, and my pictures were just a little ordinary. As I was photographing this event, another began to start alongside. As so often in London I had something else to photograph that I’d not known about when I left home (they almost make up for the times when I go to advertised events to find nothing at all happening.) Students often write to me asking where there are lists of protests or how I found out what is happening in London, or asking me to send them a list of events they can photograph. There really are no overall lists, although there are a number of web sites worth looking at to find what is happening, but many groups remain curiously secretive about their activities. Amateur photography magazines sometimes publish lists of events to photograph, but that has always seemed to me to be the wrong way round, as if there are certain aspects of life, certain events that are photogenic, and that if you want to be a photographer you go to these and take photographs. As if the aim of photography is to photograph the photogenic. 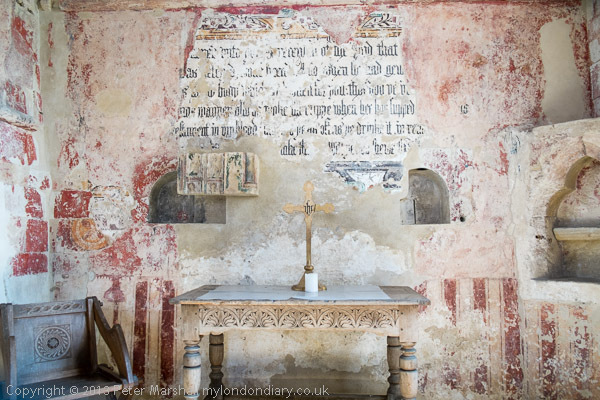 My advice is always for people to get interested and involved in things and then to photograph them. Photography, as I’ve so often said isn’t about making pictures. 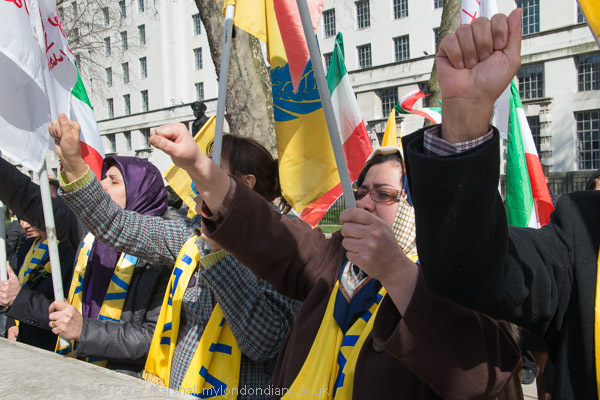 The group appearing alongside was the People’s Mujahedin of Iran, one of the military groups which combined to overthrow the Iranian regime in 1965, but which then lost out to the Islamic regime and had to take refuge in Saddam Hussein’s Iraq. After the US invasion they gave up their arms and were confined to their camp by US troops while they were allowed to become a leading part of the Iranian parliament in exile, the Paris-based National Council of Resistance of Iran. But in 2009, control of their camp was transferred to Iraq, and since then they have been moved and subjected to attacks, regarded as a terrorist group by both Iraq and Iran, although the EU removed them from its list of terrorists in 2009. 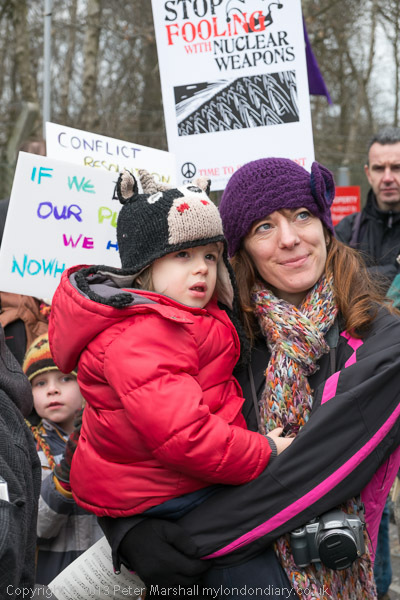 The London protest was to get support from the UK government for the appeals they have made to the UN Secretary General and the US for the protection they are entitled to under the Geneva convention as recognised by the US in 2003. 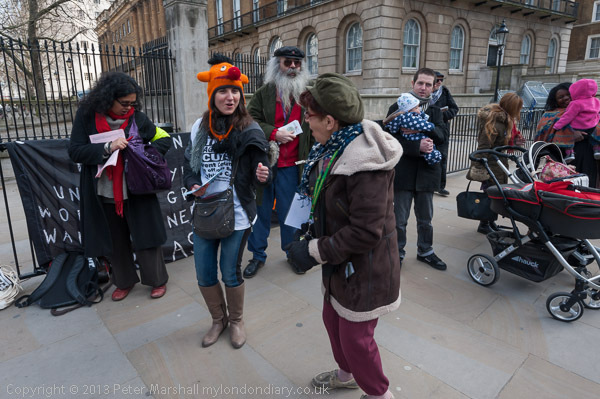 The protest was quite a contrast to the open and somewhat chaotic freedom of the event I had just been photographing, which had little form and where everyone present was invited to make use of the megaphone – and ‘open mike’ event. 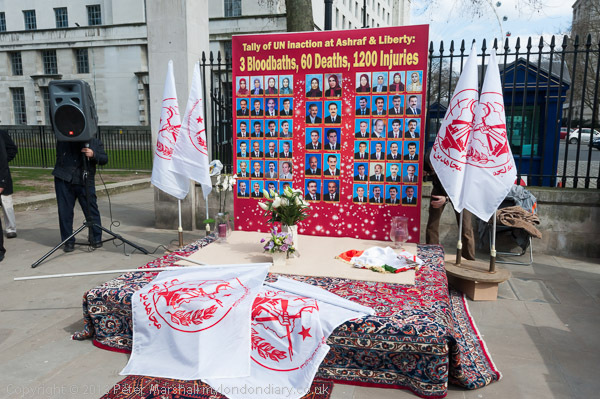 Behind the protesters was a platform that was a shrine to the many PMOI members who had been killed in the attacks, with rows of their photographs, and the protest itself had the precision of a military exercise, carried out to the beat of a drum and under clear direction, with the protesters responding in remarkable precision to the call if their leader. 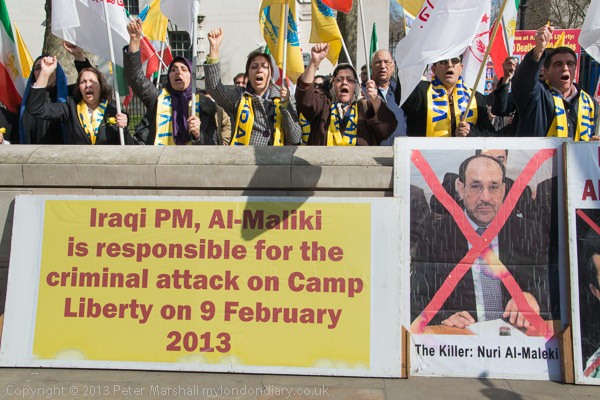 I mean no disrespect – it was just a very different way to organise, and I tried to show this in my pictures, as I hope you can see in PMOI Protest Iraqi killings. I’ve been privileged to hear Guardian photographer Sean Smith show and talk about his work in person, and you can do so on as a part of the French Cultural TV network Arte’s IRAK – 10 years, 100 viewpoints available on-line in French, German and English. Smith’s contribution has some stunning images along with his own low-key dead-pan commentary, which puts the work into context, and avoids the kind of glamorisation of horror which I’ve sometimes felt – for example – in World Press Photo exhibitions. His is a view from the position of the ordinary people – both the people of Iraq and also of the US soldiers he got to know as he shared their experience, walking “a mile in their shoes” on patrol and in camp. Also from the Guardian is cartoonist Steve Bell, and talking and showing how his work laid bare the lies told by Bush and Blair. His is powerful work, memorable and unfortunately only too true, but although I respond to it warmly, there is something about the ordinariness of photography that for me at least leaves a more lasting residue. But there is so much more on the site to explore and appreciate (enjoy is perhaps not an appropriate word), and although I’ve peeked at a few other sections I haven’t yet had time to look properly. Feel free to comment about both the parts of the site I’ve mentioned and those I’ve so far missed. And thanks to David Hoffman for sharing Sean Smith’s “masterpiece of photography, courage and endurance” on Facebook. 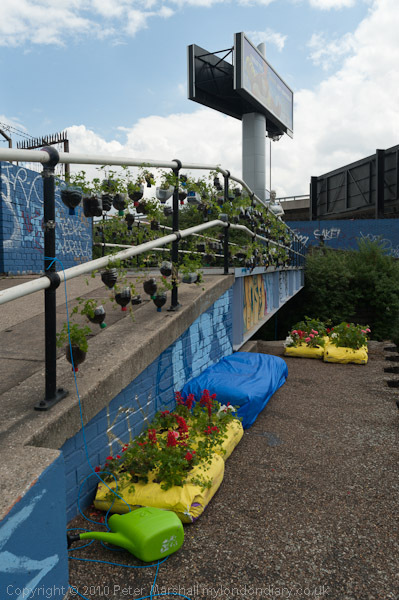 We would chose about the coldest days of the year to spend three days walking the Thames Path. Not of course the whole of it, but the upper reaches to the source, starting in the middle of nowhere west of Oxford and ending up at the stone placed in a rather dry field by the Thames Conservators to mark the spring from which, at least sometimes, the Thames is said to flow, before retracing our steps a mile or so and diverting to a conveniently placed station. Of course I’d walked parts of the Thames path well before it existed as a national trail, opened only 17 years ago, and somewhere have a copy of the proposal put out for consultation a few years before that, though I can’t remember if I made any contribution to that. But before then I’d walked and cycled most of the places one could walk along the river in and around London, as well as most as far as Reading. And in the last few years, I’ve walked along most of the rest in days out from home. 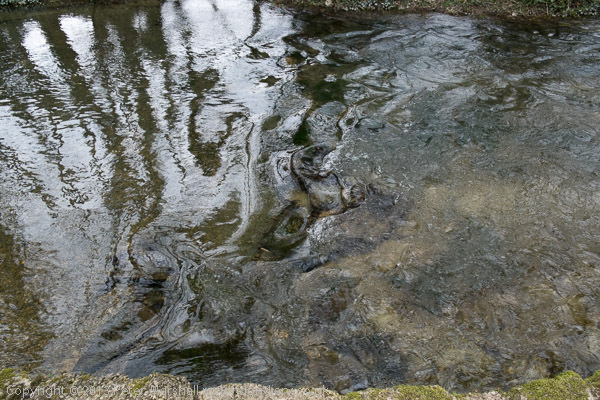 But beyond Eynsham, a few miles upstream of Oxford, the river avoids most places readily accessible to public transport until it reaches its source, a mile or so from Kemble station, one of the few stations left after Beeching’s over-drastic pruning of our rail network. Kemble itself lost two of the three lines that served it, a much more important railway junction than would be expected from the village – and it serves a rather greater area, particularly the town of Cirencester, just four or five miles north-east. My son who had worked out all the details had thought that April would be in the spring rather than the near-Siberian weather we found. 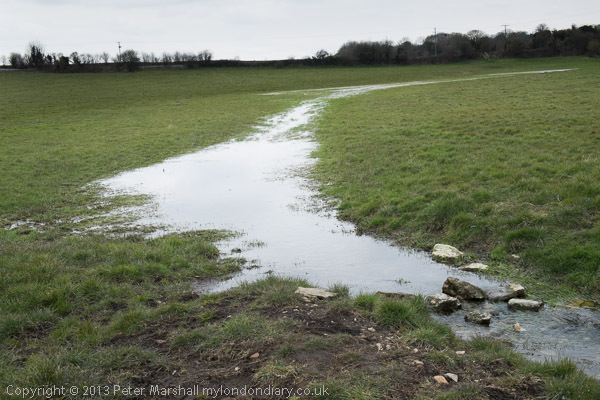 Cold weather isn’t necessarily bad for walking, and popular paths are less crowded than in summer, and we were at least lucky there had been little rain for a week or so, as parts of the path are often flooded, particularly in winter. Apart from one major and well-marked diversion the paths were fairly dry and we met relatively little deep mud. We were carrying the essentials – spare clothing, medicines etc – on our backs, and I didn’t want a heavy camera bag. I packed my stuff into a cheap photographic backpack, bought a year ago but never used for its purpose. I found I could just fit my two Nikons, flash, extra lenses etc in it, but it was a pain to get the kit out when I needed it or wanted to change a lens. Although carrying the weight is easier on your back, I also find backpacks get in the way rather more than a shoulder bag, both your own way and that of others when you are in a crowd. So I pulled out the removable dividers and in went the spare clothes, sponge bag, spare shoes etc, leaving no space for a camera. I could still have fitted in a notebook computer, but decided I could prefer to be without electronic communications for the three day trip. No point getting away from it all if you don’t get away from it all. In what I call a toy camera bag (it came as a free gift) I put the Fuji X Pro1 with the 18-55mm zoom, the Nikon 10.5mm with its adapter fitted, and a couple of Leica fitting lenses again with an adapter, the 15mm Voigtlander and the 90mm Elmarit, a few spare batteries (the charger went in my back pack.) It was a reasonably comprehensive kit, weighing less than 5 lb and there was still room in the bag for sandwiches and a bottle of water. 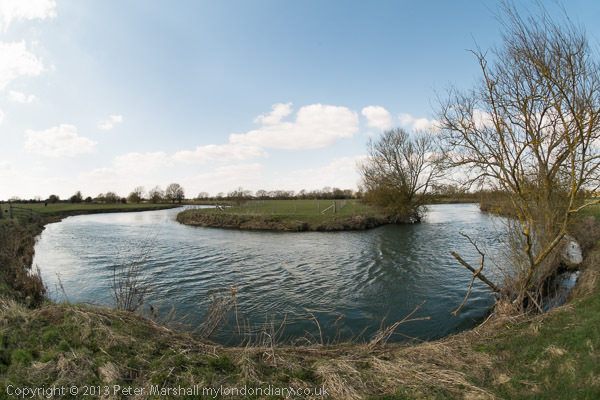 Some of the more interesting pictures to me were made with the 10.5 semi-fisheye, though it is a little inconvenient in use, with no aperture markings and infinity focus at around 0.3m on the scale. You can focus accurately by setting the camera body to manual focus and pressing the main command dial, which zooms into a digital view of a small enlarged central area. Of course the lens gives a far too wide view for the optical finder to be of much use, but the digital finder is fine. Were I to redesign the XPro, I’d either leave out the screen on the back of the camera, or if I left it on, make it swivel and tilt. As it is I’ve yet to come across any situation where I would use it for taking pictures, when either the optical or digital viewfinder view are both so much superior. It’s only real use is for showing other people the pictures you have taken or for close-up pictures of your feet or things close to them, when it saves your knees a little. And of course I’d get them to take a look at battery life, and to get an instant response to a half press on the shutter button whatever else the camera was doing. In use, the gear all performed well if sometimes rather slowly, though I don’t think I got around to using the Leica fit lenses, certainly very little. I still don’t know why sometimes the bright line frame in the optical viewfinder seems to take around 10s to appear, and I saw rather more of the backs of my two companions than I would have liked as I struggled to catch up with them after stopping to take photographs. The heavyweight Nikon is faster in use, but certainly would have been a lot harder to carry. You are currently browsing the Re-photo blog archives for April, 2013.